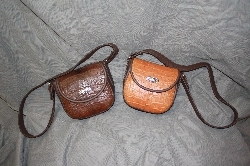 Brown cowskin leather purses with alligator front and tops. . Looks really great with zebra, wildebeest, etc. also. Reflections Taxidermy accepts all major credit cards.